Let’s break from our EU Austerity Drinking Tour for something closer to home. 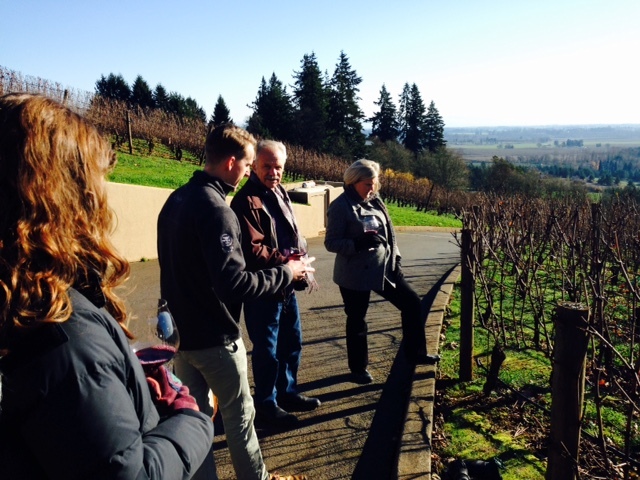 This Thanksgiving our family took a turkey break and visited Pinot Noir country in the Willamette Valley of Oregon. Stops at Archery Summit, Angela, Lange, and Troon all highlighted the many forms and clones that Oregon Pinot could take on. Differences abounded but a taught line of bright acid unified them all. Also bodies never went bigger then medium, colors were clear and medium, and flavors tended toward wild cherry, mineral, clove, and minimal oak. After a day of zippy, lean Oregon Pinot our guests had brought a Pinot Noir from home. Home is Paso Robles, California. Jack Creek’s goal since 1997 has been to create New World Pinot Noir, which is smart, because Paso Robles is consistently hot, dry, and sunny, especially compared to anywhere in the Old World. So how does Jack’s 06 Pinot fair? Appearance: It is clear…probably. Honestly, imagine purple ink, fat legs, and minor particulates from the last eight years. Aromas: Clean, bold aromas glow of just-made, hot, black cherry jam, nutmeg, and light mocha. Palate: No sweetness shows off a nice, moderate acidity, minor, dusty tannins, but a surprisingly unobtrusiveness, albeit warm, medium plus alcohol. This all creates a medium plus, plump, body: nothing near the lean Nor-westerners we had earlier. Flavors: a powerful hot iron cuts across my palate. This is the steel of alcohol from a hot climate. Tobacco, and a forest of wood flushes well with twangy black cherry. The fruit drops out a bit, but other flavors last a long length. Conclusions: Location, location, location. Jack Creek’s Reserve Pinot Noir 2006 redefines Pinot Noir. 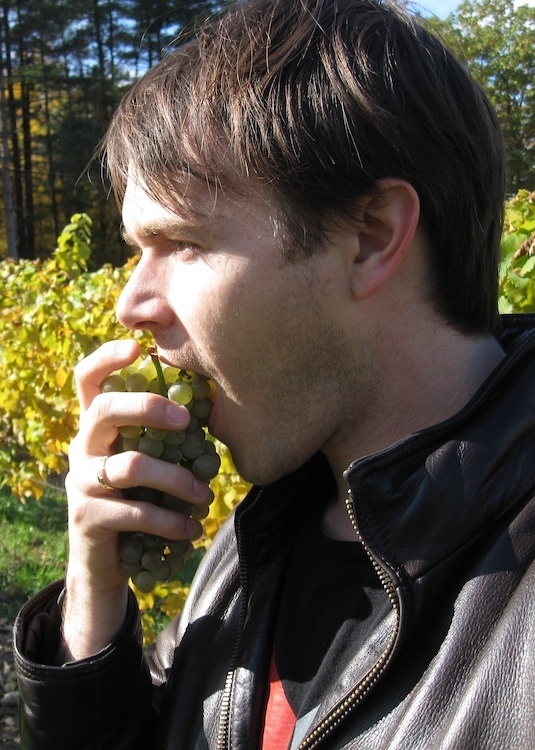 It reminds us that place can obliterate what we assume a grape type should taste like. Our ignorance is the fault, not the wine. Jack’s Pinot is sleek, hot, and purple: just what one should be from Paso. Moreover, it manages to retain enough freshness and acid (even after eight years) to balance itself into something easily drinkable and pair-able. Those lean Oregon Pinot’s we had that day were equally good, just different, because they must be. Nevertheless, Jack Creek made an outstanding, Pinot Noir (5 of 5). Bravo. This entry was posted in Pinot Noir, Uncategorized and tagged 2006, and Troon, Angela, Archery Summit, California, Central Coast, Estate, Jack Creek Cellars, Lange, Oregon, pinot noir, Pinot Noir Reserve, Willamette Valley, yamhill carlton. Bookmark the permalink. 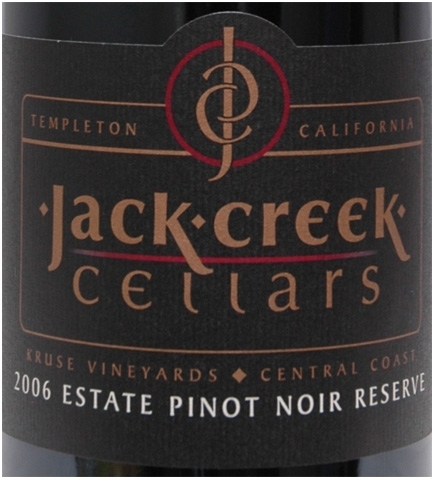 The 2006 Jack Creek Cellars’ Pinot was an outstanding wine to share with you ! 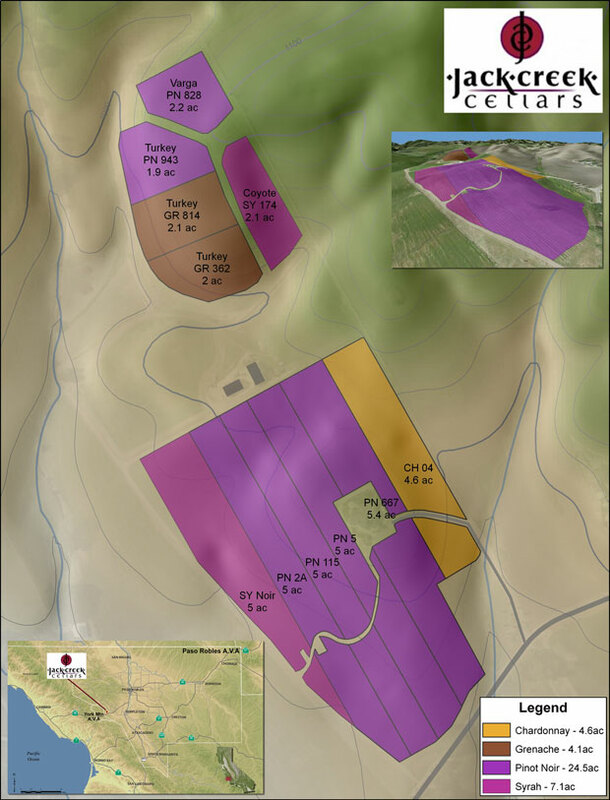 We look forward to your expert opinion on more wines from the Paso Robles AVA’s. It was a stellar bottle and a much aporeciated treat!